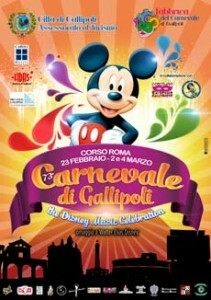 The municipal administration of the town of Gallipoli and the Fabbrica del Carnevale, proudly present the programme for the 2014 Gallipoli Carnival, this year marking the 73rd edition of this exciting event. The theme for this year is a homage to Walt Disney and on Sunday you can go into the specially designed hangar and help with the preparation of the papier-mâché carriages for the parade the following Sunday. There is a photographic exhibition featuring past carnivals organised by the Associazione Fideliter Excubat, followed by a FIERA DEI SAPORI DEL CARNEVALE – a “tastes of the carnival “ fair.There are also games and entertainment for children along the streets of the city centre.